All sales to benefit the Mary King Research Library fund of MCHS. 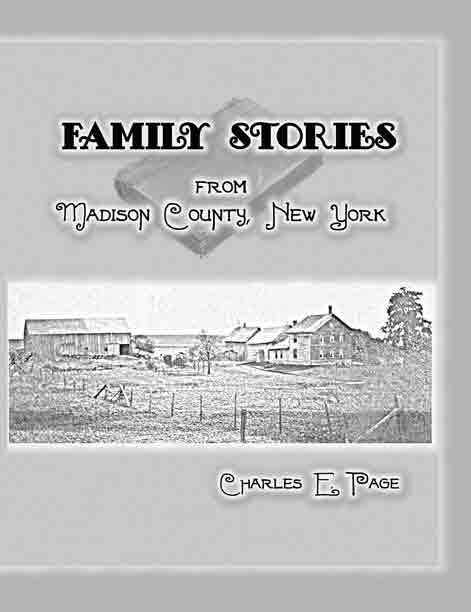 Charles E. Page, the third generation of his family to farm in Madison County, New York, wrote Family Stories from Madison County, New York, from the events recorded in his grandmother's journals and his own personal diaries. Excerpts from his grandmother's journals record the day to day events of Madison County family farm life from 1885 to the 1940's. Now in his 80’s, Charles E. Page has lived in Madison County all his life as did his parents and grandparents. In writing this book, he is passing on an idea of how he lived and what he saw and heard in the three generations of his family’s life in Madison County. The events described are as he remembered them. Also included are miscellaneous anecdotes and tales. Proceeds from the sale of this book benefit the Mary King Research Library fund of the Madison County Historical Society. This 204-page book with interesting photographs is available from MCHS. Send a check for $18.95 plus $6 shipping to: Madison County Historical Society, 435 Main Street, Oneida, NY 13421. NYS residents should add 8% sales tax ($2.00) for each copy ordered.